The Falls Wedding Chapel is the most trusted and well-established Wedding Chapel in Niagara Falls USA. Throughout our history, we have proudly maintained an A+ consumer rating with the Better Business Bureau. The Falls Wedding Chapel has received national media recognition from ABC’s Good Morning America, The Travel Channel, and Extra!. We have also been featured in Brides, Cosmopolitan, and New Woman Magazines. Whether you want to elope or are planning a destination wedding for 2-200 guests, The Falls Wedding Chapel can provide your venue and assist you with your wedding needs. Our experienced staff is sensitive to your wishes and is creative in carrying them out. We are dedicated to helping you celebrate your love in the most meaningful, heartfelt, and memorable way possible. The personal attention and superb quality of service you receive from our staff and ministers is unlike any other chapel. 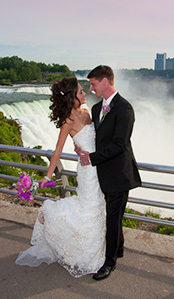 Experience the dramatic setting of Niagara Falls as you prepare for the most exciting and romantic day of your life!